Graduates at the Fall 2006 commencement ceremony (Photo by Bryan Quinn). 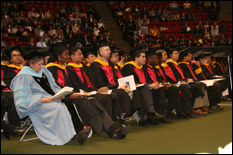 The Clark School's fall commencement ceremonies took place on December 21 in the Cole Student Activities Building. BAE Systems President and CEO Mark Ronald served as commencement speaker and mechanical engineering student Nicholas Fernandez served as student speaker. Ronald compared a slide rule and modern technologies to describe the changes in engineering that graduates will experience in their futures. Fernandez urged his classmates to examine what was most important to them and find ways to incorporate those values in their work. Also at the ceremony, winners of the Clark School's E. Robert Kent Outstanding Teaching Award for Junior Faculty and Outstanding Staff Service Award were announced. Sheryl Ehrman, associate professor of chemical and biomolecular engineering, was presented with the junior faculty award. She was honored for work to inspire and mentor undergraduate students. Eric Schurr, assistant director in the Maryland Technology Enterprise Institute (MTECH), received the staff service award for his dedication and enthusiasm in communicating the work of MTECH and the Clark School to the news media and the general public. In what has become a tradition at the event, students modified their mortar boards to indicate their areas of interest, with three fire protection engineering students donning large and colorful fire helmets.